All organizations must address threats, opportunities and requirements by encouraging desired conduct and conditions and preventing what is undesired. Organizations need to establish a mix of proactive, detective and responsive actions and controls, supported by strong analytics based on strategic objectives, risk appetite and capacity, and risk decision-making guidance established by leadership. 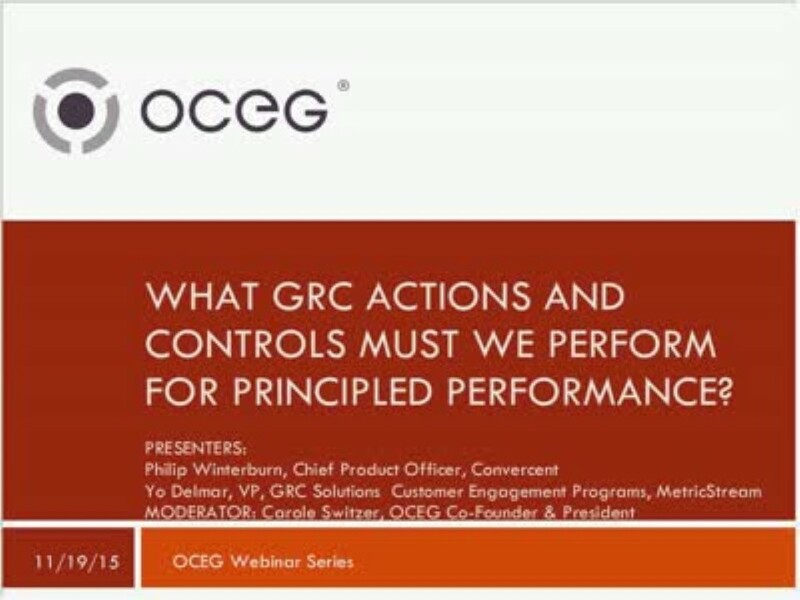 In this webinar we review the key steps for performing GRC actions and controls that support Principled Performance, as outlined in the OCEG GRC Capability Model Perform Component. We have emailed instructions to access What Actions and Controls Must we Perform to Achieve Principled Performance GRC Capabilities Illustrated Series to . Make sure the email arrives in your inbox: either add "support@oceg.org" as a safe sender to your email platform, or if you use Gmail, drag our email into your Primary tab.